Gaiman has delivered a wonderfully chilling novel, subtle yet intense on many levels. The line between pleasant and horrible is often blurred until what's what becomes suddenly clear, and like Coraline, we resist leaving this strange world until we're hooked. Unnerving drawings also cast a dark shadow over the book's eerie atmosphere, which is only heightened by simple, hair-raising text. Coraline is otherworldly storytelling at its best. This was a simple story which made for a quick read. It's also pretty short. You could tell it was aimed at young readers as the language was much more straight forward compared to Gaiman's adult focused books. 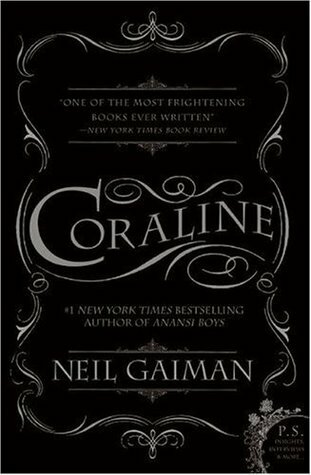 It had the usual Gaiman darkness to the story which, among other things, have made me a fan of his. I like how he doesn't shy away from the darker side of life even with his children's books. Even though it's dark in places, it's not particularly scary. That said, I did find a couple bits gave me the heebie-jeebies, but I think it's just me. I have a thing about eyes and Coraline's other parents had black buttons sown on where their eyes should be and combined with my over-active imagination it made me shiver and cringe. I don't really need to explain what the story is about as the synopsis above pretty much covers the whole story. I think whoever compiled the book blurb on the back could have revealed less of what was to happen especially as it's a pretty short book - they've not really left anything to surprise! I loved the eerie drawings at the beginning of each chapter too. Another fantastic read by Neil Gaiman. I read this for a "Name that Tune" themed read-a-thon in which I had to choose a song and change it's lyrics to relate to the book in some way. You can read my Coraline song here.